CASTRIES, Feb 25 2015 (IPS) - At Plas Kassav, a roadside outlet in Canaries, a rural community in western St. Lucia, a busload of visitors from other Caribbean countries, along with tourists from North America and Europe, sample the 12 flavours of freshly baked cassava bread on sale. 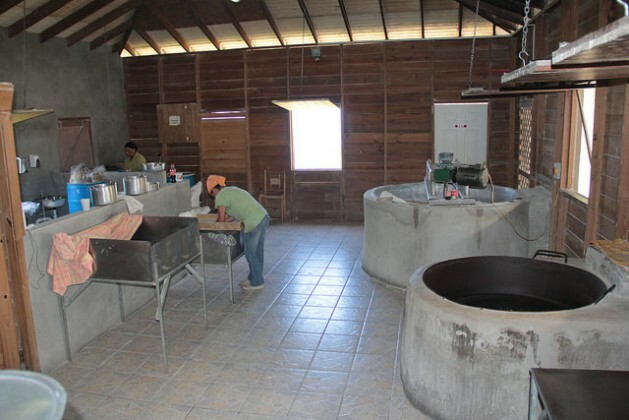 In the back of the shop, employees busily sift the grated cassava and prepare it for baking. Next to them, an electric motor powers a device that turns grated cassava as it bakes into farine — a cereal made from cassava tubers — in a wood-fired cauldron. This is one of the ways in which this eastern Caribbean nation of 180,000 people is marrying its tourism and agriculture sectors. 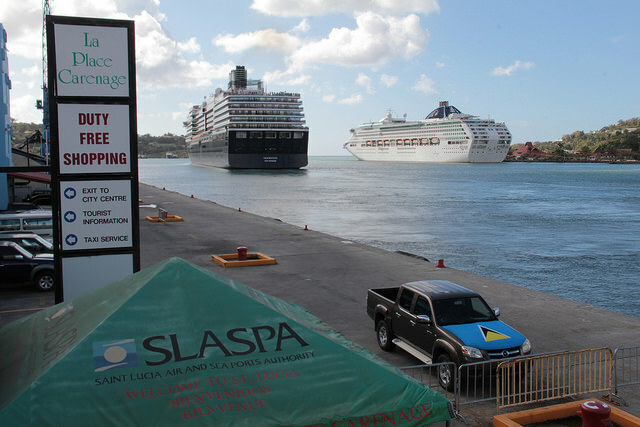 Tourism makes the largest contribution to St. Lucia’s 1.3-billion-dollar economy. And with oil prices expected to continue falling for some time, this 617-square-kilometre island is hoping for significant economic growth on the heels of the slim years since the global financial crisis struck in 2008. The government says that the move toward renewable energy will see businesses and households paying less for energy and will also strengthen the nation’s argument at the international climate change negotiations. A renewable energy expert with the International Renewable Energy Agency (IRENA) tells IPS that falling oil prices present an excellent opportunity for small island developing states such as St. Lucia and its 14 other Caribbean Community (CARICOM) allies to accelerate their renewable energy programme. “I think you can look at it as a windfall that buys you time for the transition,” Dolf Gielen says. He tells IPS that falling oil prices will slow down but will not end the push towards clean energy. James Fletcher, St. Lucia’s Minister of Public Service, Sustainable Development, Energy, Science and Technology, tells IPS that he agrees that the region needs to accelerate its transition toward renewable energy, but is not certain whether lower fuel prices is really reason to exhale. “I’m not sure about the breathing space. I think what it does, however, show is that this fuel price game is not one we want to be playing,” Fletcher tells IPS. He notes that while the price of oil has fallen to 50 dollars a barrel — less than half of what it was half year ago — the decrease did not result from any advances in technology. “The price of oil right now is being determined by the geopolitics of oil,” he says, noting that Saudi Arabia has increased its production in an effort to make production of shale oil in the United States and Canada less attractive. If the Caribbean is really serious about sustainable development and wants its economies to develop with some level of certainty, “we can’t be at the mercy of a widely fluctuating oil market,” Fletcher stresses. As opposed to dependence on oil, Fletcher says, if Caribbean countries are depending on renewable energy then there is “much more certainty” of what the price of energy will be. “… With prices fluctuating so much not because of any huge difference in technology and any difference in supply in the Middle East or any glut in the supply market, I think that’s why we should be getting pursuing our renewable energies programme with more haste and more energy,” Fletcher tells IPS. In St. Lucia, consumers pay 38 cents for one kilowatt-hour of electricity. The government hopes that its investments in renewable energy could see that price reduced to 30 cents. St. Lucia is home to Sulphur Sprints, the “world’s only drive in volcano” — a smoking caldera located near Soufrière on the southwestern side of the island, where the natural heat boils the water and geysers shoot into the air at high tide and full moon. It stands to reason that geothermal energy will be the nation’s focus as it pivots to renewable energy. St. Lucia has received financial and technical support from the government of New Zealand, SIDS-DOCK, and the Global Environmental Facility to conduct the initial stage of exploration, which will start soon, Fletcher says. LUCILEC, the state-owned power company in St. Lucia, will purchase the electricity from the power plant developer, ORMAK of Isreal, and resell it to consumers. Fletcher tells IPS that the government is pleased with the pace of the negotiations but notes that developing geothermal potential takes time. “But at least it puts us on track to developing what we believe is as much as 30 megawatts of geothermal energy in Soufriere,” he says. 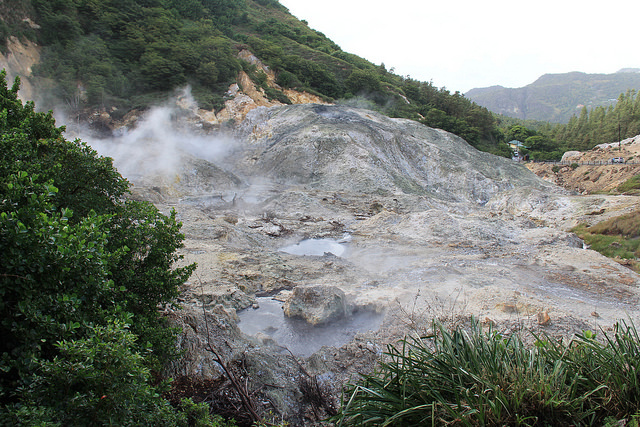 And while geothermal energy has been identified as the booster that St. Lucia’s tourism industry has been longing for, exploiting that same renewable energy potential could deal a devastating blow to the nation’s tourism product. “There is one little wrinkle in that, because the drive-in volcano is also located within the Piton Management Area, and the Piton Management Area is a UNESCO World Heritage Site and it is located in one of the policy areas where we are restricted in the level of infrastructural development that can take place,” Fletcher explains. St. Lucia is also exploring the development of a 12-megawatt wind farm on the island’s east cost and has been having discussion with an entity in the United States in this regard. The third element of the renewable energy push is solar PV, the first stage of which will be done by LUCILEC, which has invited responses to proposal for a 1.2-megawatt facility in the south of St. Lucia, the intention being that it will be scaled up to 3 megawatts in the near future. In this regard, the government is working with the Carbon War Room and the Clinton Initiative, which have been supporting the renewable energy programme. Fletcher tells IPS that the move toward renewable energy, coupled with energy saving initiatives — such reducing from 4.0 million dollars to 2.6 million annually the amount spent on street lighting by switching to LED bulbs — will have a “tremendous” impact on St. Lucia. The government is moving to make its own buildings more energy efficient, and will take to Parliament legislation to provide home and land tax, income tax rebate for people who are retrofitting their homes with energy efficient devices or installing grid-tie solar PV. “What that does is many-fold. First of all, it causes our economic sector to be much more competitive,” Fletcher says, adding that a large portion of spending in the tourism sector is on energy. “When you now superimpose on that the work we are doing with renewables, that, hopefully, will cause a reduction in the price of electricity from what it is right now, which 38 US cents per hour, to something approaching 30 cents. Then the expenditure by our hotels, by our manufacturing sector, the expenditure by people who are interested in value-added in agriculture, that expenditure goes down and it makes those sectors more competitive,” Fletcher tells IPS. Fletcher is one of St. Lucia’s and CARICOM’s negotiator at the global climate change talks, where the nations of the worlds are slated to sign a binding deal for reducing global warming in Paris later this year. He tells IPS that at the international climate change negotiations, St. Lucia has been saying to developed countries that they have to reduce their emissions of greenhouse gases to keep global warming to two degrees above pre-industrial levels, as proposed by experts. “Now, it strengthens our case. It strengthens our moral argument if we can say that a country like St. Lucia that contributes … something like 0.00078 per cent of all green house gases, we recognise the importance of this being a global effort and we are still committing to reducing our carbon footprint by 30, 40, 50 per cent. “Then we believe that the big emitters, like the United States, like the European countries, like China, like Russia, that they also should be doing more to reduce their greenhouse emissions. So, I think it strengthens our hand in the international negotiations where climate change is concerned,” Fletcher tells IPS.